For the US Navy ship captured from the Spanish Navy, see USS Elcano (PG-38). It is named after Spanish explorer Juan Sebastián Elcano, captain of Ferdinand Magellan's last exploratory fleet and the man to lead the first circumnavigation of the world. The ship also carries the Elcano coat of arms, which was granted to the family by Emperor Charles I following Elcano's return in 1522 from Magellan's global expedition. The coat of arms is a terraqueous globe with the motto "Primus Circumdedisti Me" (meaning: "First to circumnavigate me"). 'Juan Sebastián de Elcano' was built in 1927 in Cadiz, Spain, and its hull was designed by the naval architect Mr C E Nicholson of Camper and Nicholsons Ltd of Southampton. Constructed by Echevarrieta y Larrinaga shipyard in Cadiz. After the proclamation of the Second Spanish Republic in April 1931 the ship became part of the Spanish Republican Navy. In 1933 under Commander Salvador Moreno Fernández's order, a series of improvements were made to the ship and the bronze plate with the Latin language inscription Tu Primus Circumdedisti Me was placed near the prow. At the time of the coup of July 1936 Juan Sebastián Elcano was at Ferrol, a harbor that had been taken by the Nationalist faction. Its plans were used twenty-five years later to construct its Chilean sail training vessel sister ship Esmeralda in 1952-1954. Its first voyage was sea testing between April and July that year from Cádiz to Malaga, with King Alfonso XIII on board as a passenger, and then on to Sevilla, Las Palmas, Tenerife, San Sebastián, Cádiz, São Vicente, Cape Verde, Montevideo, Buenos Aires, Cape Town, Adelaide, Melbourne, Sydney, Suva, San Francisco, California, Balboa, Panama, Havana, New York City, Cádiz. Commanders that have been in charge of Juan Sebastián Elcano for crossings and instruction. Fernando Villaamil, and his circumnavigation in 1892-1894 commanding the Nautilus training ship. Spanish Naval Academy In modern times, Institution where the Spanish Armada (i.e. : Spanish Navy) officers and other personnel receive their education. El Galatea (also known as Glenlee) From 1922 till 1969 she was the Training Tall Ship for the Spanish Navy in Ferrol (North-western Spain). El Club Naval de Ferrol Originally designed for the amusement of the Spanish Navy personnel and their families posted to the Naval Station of Ferrol. 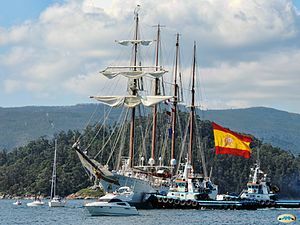 Wikimedia Commons has media related to Juan Sebastián Elcano.